Going through Recruitment can be stressful for some students, and it can be equally as stressful for parents and loved ones. Some family members were involved in Greek life during their time in college, but for others being a member of a sorority is a new concept. Whether you were involved in Greek life or this is a new experience for you and your daughter, it is important to familiarize yourself with the Recruitment process here at Georgia Tech. If you have any questions, feel free to reach out to Recruitment Vice President, Carly Schmitt, at rvp.gtcpc@gmail.com. The Recruitment process has drastically changed over time and varies between institutions. Here, at Georgia Tech, we have a fully structured, formal Recruitment process. This means that your student will have the opportunity to meet every chapter on our campus. Each chapter and each university may have a different Recruitment process, so we encourage everyone to go through the Recruitment process with an open mind. We understand that you and your daughter may be nervous about going through the Recruitment process. Please know that the Panhellenic Association at Georgia Tech is always here to answer your questions and put any rumors to rest! Refer to our website, Facebook or Instagram for updated tips and information about Recruitment. At Georgia Tech we have a values-based Recruitment process. This means that the women in our chapters are looking for women that have similar values to join their chapter. When going through Recruitment, your daughter should ask questions to see if her values align with the women that she is conversing with at each chapter. At night, you can talk to your daughter about how her Recruitment experience is going. Help her reflect on her values and see which chapters’ values she connected with that day. A recommendation is a personal letter of reference provided by an alumna of a sorority to her sorority’s chapter at Georgia Tech. The purpose of a recommendation letter is to simply introduce your daughter to the sorority so that the chapter members may become better acquainted with them prior to recruitment. As a general disclaimer, Georgia Tech does NOT require letters of recommendation in order to participate in our formal Recruitment process. That being said, if you do want to submit recommendation letters, you can find the delivery addresses for each chapter under the Chapters tab. Reference and recommendation letters do not guarantee a bid for membership. Recommendation letters are not required to receive a bid, and you will not be penalized in any way if a letter or form is not submitted on your behalf. All of our Panhellenic chapters with houses offer meal plans for the 2019-2020 academic year. Sorority meal plans are included in dues and vary from chapter to chapter. Typically, sororities provide dinner on Monday-Thursday and lunch from Monday-Friday. During the Financial Round of Recruitment, each sorority will describe the type of meal plan they offer. Feel free to have your daughter ask questions about meals during this round! If you receive a bid from one of our chapters, you will be allowed to reduce your Georgia Tech Dining meal plan to the Greek 120 meal plan. This meal plan provides students with 120 meals per semester. If you are registered for Recruitment and have an on-campus assignment for Fall, you will be allowed to move into your residence hall on Thursday, August 15. Recruitment Counselors will help your daughter move in if she is a freshman. Formal Recruitment Kickoff will take place later in the evening. Members can live in houses based on guidelines that are unique to each chapter. When deciding to join a sorority, it is important to consider the financial requirements of membership. The financial obligation varies depending on the chapter. Chapter dues are distributed to the respective national organization, the Panhellenic Council, and to the local chapter. Local chapter fees may be utilized for food, sisterhood events, activities, housing corporation fees, and chapter facility staff. The first semester of membership typically involves a new member/initiation fee in addition to chapter dues, making the first semester of membership more expensive than the rest of your semesters. Joining a sorority is a financial obligation that should be taken seriously and discussed with everyone involved. During investment round, chapters will give comprehensive financial presentations to the Potential New Members. After the presentations, the Potential New Members will have the opportunity to ask the chapter women any specific questions they may have about member dues. Potential New Members are encouraged by Recruitment Staff and their Recruitment Counselors to share this information with whomever may be assisting them financially. 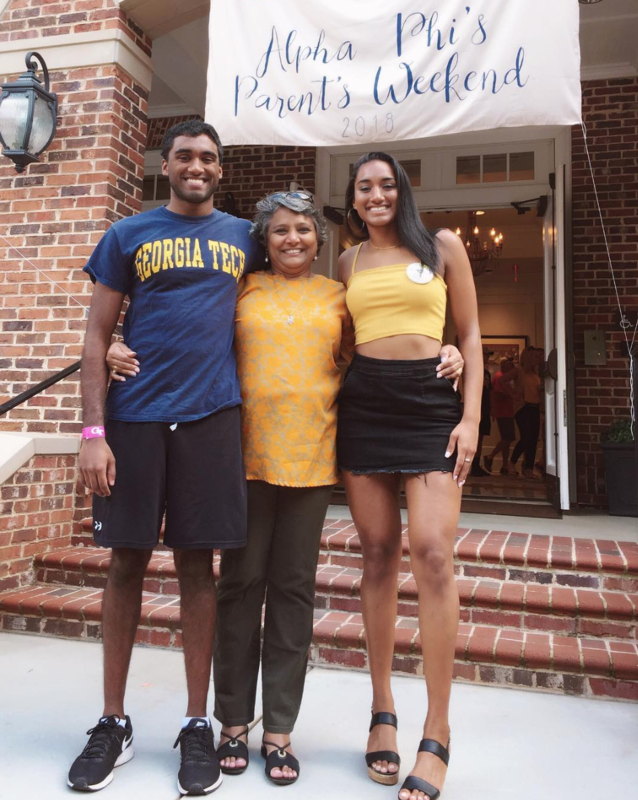 Our Panhellenic chapters love to involve parents so they can see what their daughter is up to during her time at Georgia Tech. While each chapters’ parents events vary, it is typical for a chapter to have a Family Weekend tailgate, Mother-Daughter events, and Father-Daughter events throughout the year. Whether in-state or out-of-state, our chapters find it important to make sure that parents can get a glimpse of what their daughter is up to.